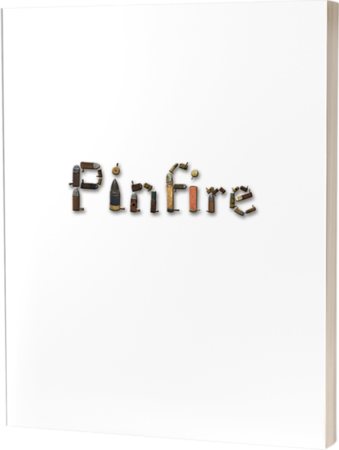 On my quest for all things related to the pinfire system I have been especially interested in the role Lefaucheux pinfire cartridges and guns played in the American Civil War. You can read about some of those articles here: Articles. 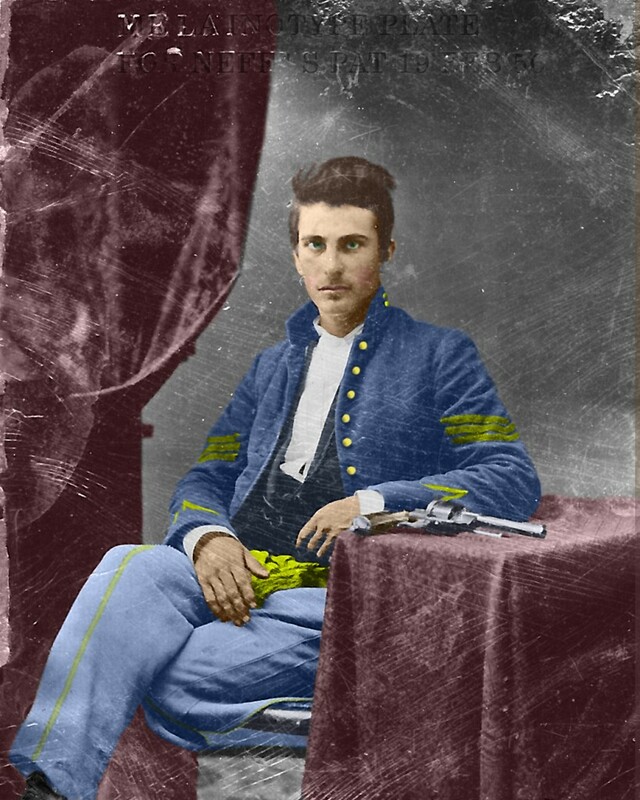 Over the past few years I have acquired a few images of soldiers from the American Civil War wielding a Lefaucheux model 1854 pinfire revolver. 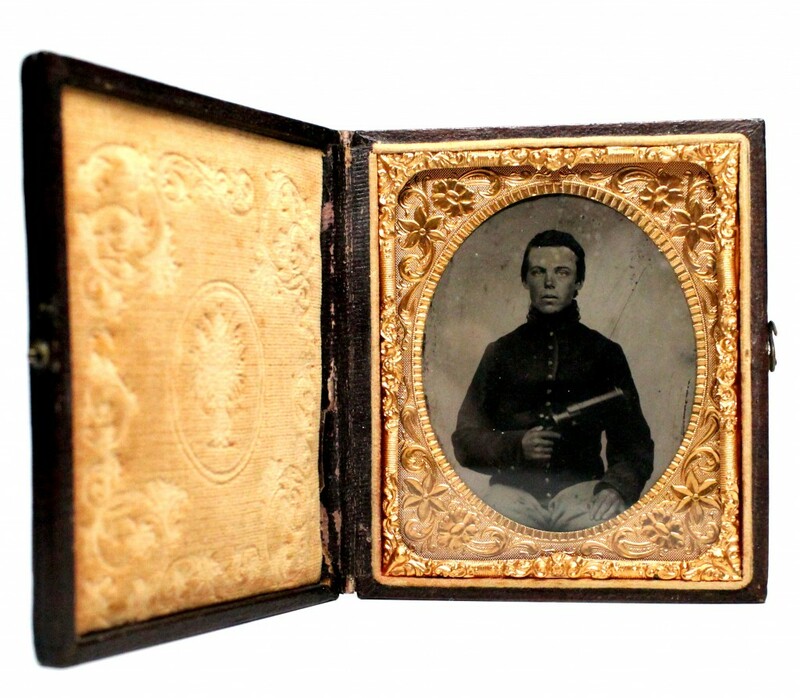 First up is a CdV (Carte de visite) image of a soldier identified as being an Officer from New York. You may notice the metal stand behind him near his shoes. For those unfamiliar with early photography, it was not just point-n-click like it is today. It could take several minutes to expose the negative images so the subject had to remain very still the whole time. This stand probably went up to his neck to hold his head in the same place. Here is a version of that image that I colored to give a better understanding of what he most likely looked like in color! 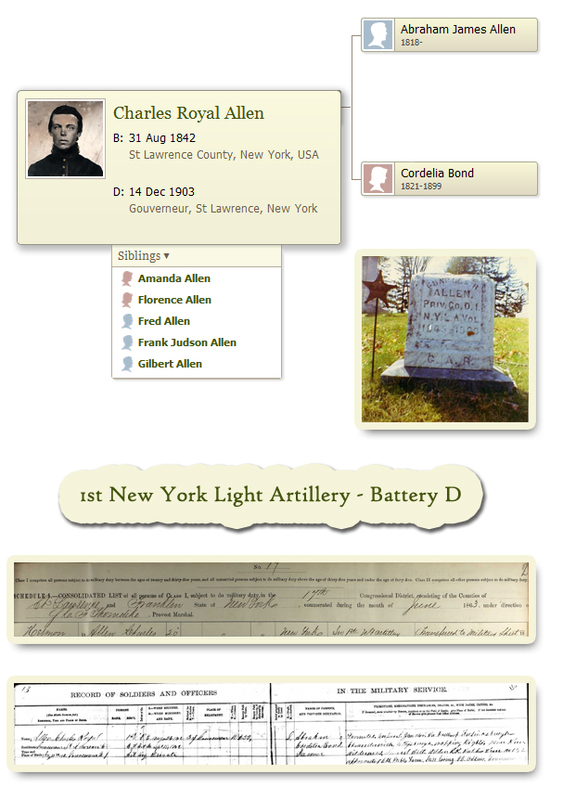 Next up is a tintype of Charles Allen from Gouverneur, St Lawrence, New York. He was kind enough to write his name and city inside the back of the tintype for me. 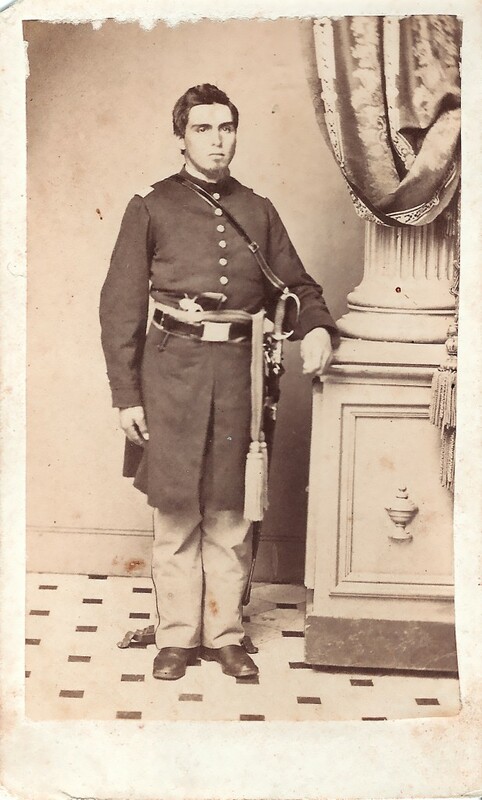 He was a private in the 1st New York Light Artillery – Battery D.
And lastly, here is an early 1/9 plate melainotype of a soldier from the American Civil War. 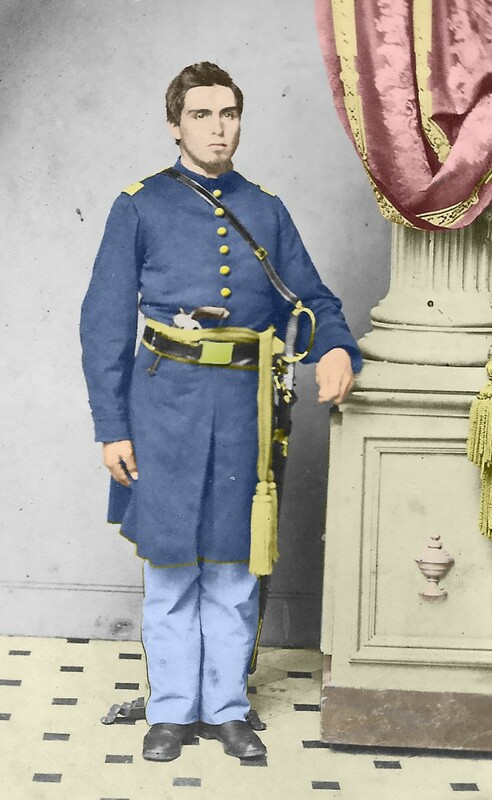 Based on his uniform he appears to be a Union Cavalry Sergeant. 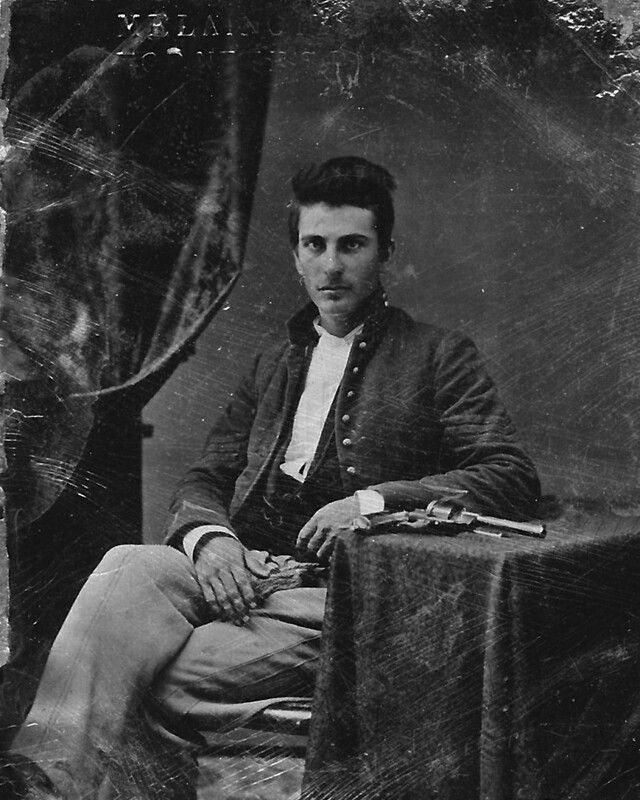 He has a Lefaucheux 1854 Pinfire Revolver on the table next to him. I personally think that he is missing his left leg as it appears that the bottom of his left pant leg is tucked under him toward the table. Some who have examined the image think he has both legs intact. Either way it is still one of my favorite images as it shows such an excellent view of the gun, and a soldier with such a stoic demeanor which I am sure was a necessity for those who had to fight their own countrymen during the American Civil War. On close examination of the revolver one will notice it is loaded as one can see the bullets of the cartridges inside the cylinder. Also, when comparing my copy of a Lefaucheux model 1854 revolver with cartridges in it I have determined that he has loaded cartridges by one of the three American makers listed in this article as they were quite a bit longer than the imported, and typical 12mm pinfire cartridges. 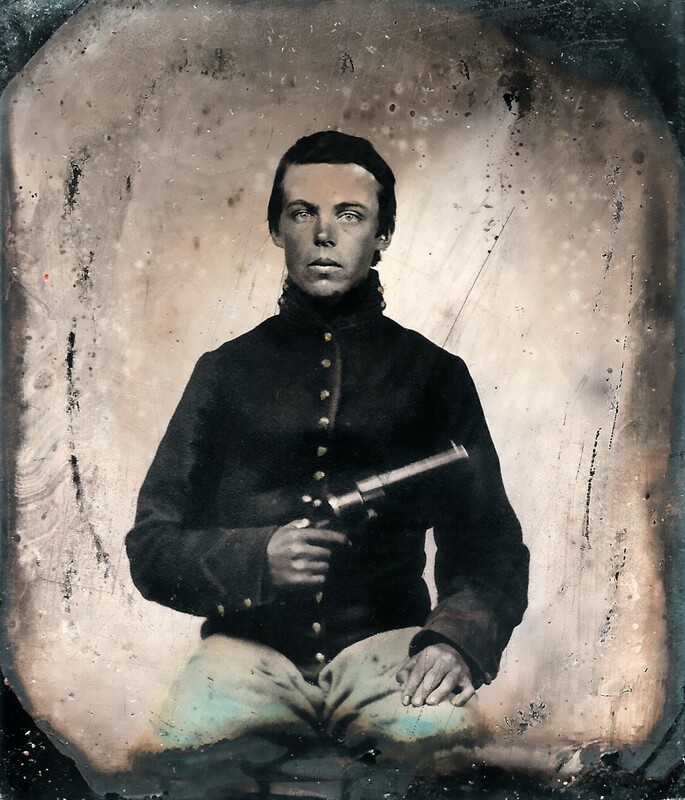 That concludes the images I have gathered so far of American Civil war soldiers with pinfire guns. 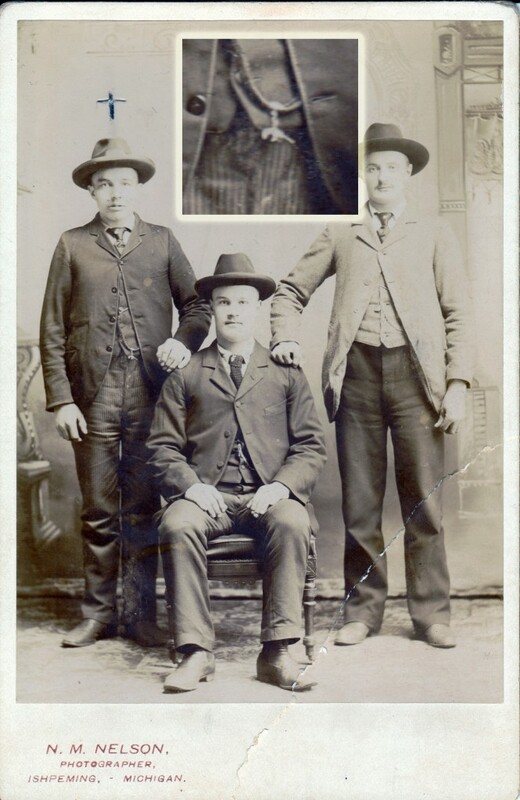 As a bonus I also have here an image of some young men from Michigan. The one on the left has one of the little 2mm pinfire guns used as a pocket watch fob. I have blown up that portion of the image to better see it as well!